Get the facts right. Determine the difference between these 3 terms and here’s the answer. A tropical cyclone is a storm system characterized by a low pressure center and numerous thunderstorms that produce strong winds and flooding rain. 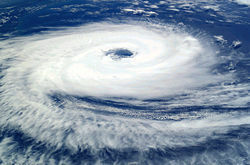 A tropical cyclone feeds on heat released when moist air rises, resulting in condensation of water vapour contained in the moist air. They are fueled by a different heat mechanism than other cyclonic windstorms such as nor’easters, European windstorms, and polar lows, leading to their classification as “warm core” storm systems. What does a cyclone looks like? A tornado is a violently rotating column of air which is in contact with both the surface of the earth and a cumulonimbus cloud or, in rare cases, the base of a cumulus cloud. 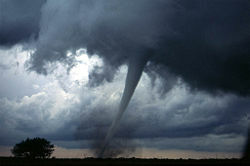 Tornadoes come in many sizes but are typically in the form of a visible condensation funnel, whose narrow end touches the earth and is often encircled by a cloud of debris. What does a tornado looks like? This was very helpful! I was looking up the tornado of May 27, 1896 in Illinois and two sites said that it was not a tornado, but a cyclone. This site helped me understand the difference. Was it a cyclone or a tornado that Dorothy and Toto experienced in Kansas way back when….. IT was a cyclone random person. Thanks for this useful information about the differences between the tornado and cyclone . this was very useful to me.thanks once again. Thanks David for the thorough description of the various differences, you site has concluded my search. Thanks again. PS: it was a tornado from the above description, that Dorothy and Toto experienced in Kansas in answer to Jim ‘s question. Being in Australia, we get a quite a few Cyclones a year ranging from Northern Western Australia to far North Queensland. From news coverage from the United States one gets the impression that Tornados are very destructive, so I have often wondered what is the difference between a Tornado or a Cyclone? I’ll take a Tornado any day. Thank you for the information, your site and explanations are a lot more helpful than other sites I have visited for answers. Purely an oceanic phenomena. They die out over land due to a loss of a moisture source. Read the article. It was a tornado.